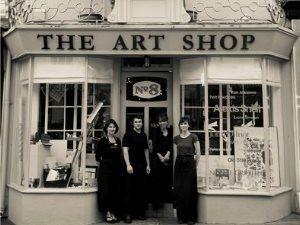 The Art Shop and Chapel at The Chapel & Kitchen01873 852690work Art GalleryThe Art Shop & Chapel exhibits work by local, international, established & emerging artists. We sell artwork by painters, printmakers, sculptors, illustrators, ceramic artists, jewellers & book artists. We hold regular exhibitions of Fine and Applied Arts. Stock the very best artists’ materials and fine papers. Nourish and delight the artist and creative child with inspirational books and independent magazines. Host workshops with painters, printmakers, textile artists, writers and musicians. Organise life drawing days for artists to do their practice – with no tutor but the occasional masterclass.